I’ve been experimenting with Docker for a while, but in the last year or so there has been an influx in the number of tools that help put Docker containers into production easily. Some of these are from third party companies, such as CoreOS, and some from Docker itself (such as the new Docker Swarm, Docker Machine, and Docker Compose. However, I’ve recently been testing a new Docker workflow that allows me to push code, have it tested, built, and deployed into a production server cluster running Docker. This is really convenient for shipping features quickly and ensures that all code on the production servers is tested and working. However, this becomes an issue at scale– Heroku is expensive. Though you receive a month’s worth of Heroku Dyno hours2 for free each month, scaling beyond a single Dyno is a minimum of $35/month for half a gigabyte of RAM. To be fair, Heroku adds quite a bit of value beyond simply providing a virtual machine, but some applications might require more flexibility than Heroku’s buildpacks provide or simply require more horsepower. Docker, of course, can replace Heroku for the actual deployment of code, but the problem of scaling still remains. Manually starting and restarting the containers when you deploy new code is certainly not ideal, so let’s take a look at different services we can use in our Docker CI/CD workflow. Docker doesn’t have an end-to-end solution for this workflow, so we need to piece together several different technologies to get the desired result. The three primary services include: a CI/CD test runner, a server provider, and a container orchestrator. There are others as well (including a plugin for the well known Jenkins CI server), though you will have to do your own research. Many services run builds in a container, but this is completely separate from whether they can build a container. As you will see later, you can also run Docker-in-Docker, so you may potentially be able to use some other services that run inside of a Docker container to build your Docker container. For my experiments, I chose the open source GitLab CI system to be used in tandem with the GitLab source control service. 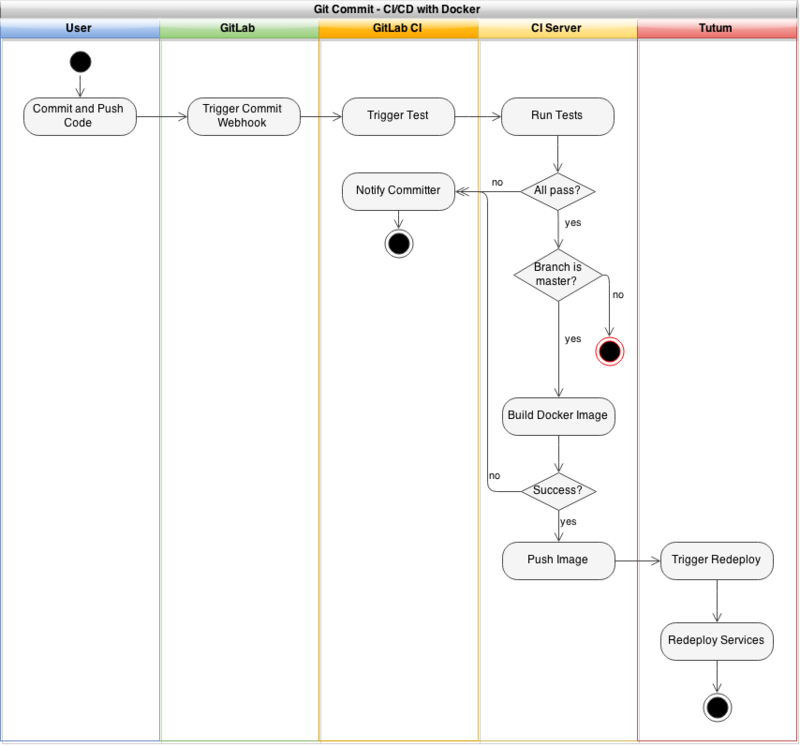 This way, I could see the build status of each commit in the GitLab interface. GitLab is also a good choice because they not only offer a free source code repository hosting service and hosted version of their CI software, but the software is open source so you can run it on your own servers as well. If you do opt to use the free GitLab CI system, you will have to provide your own test runner. The hosted CI software they run only coordinates test runners– it doesn’t actually execute your test jobs. You can either launch the runners on a server provider, or you can actually run them locally on your machine (either bare metal, in a VM, or in a Docker container). Of course, you also need a server hosting provider for the Docker daemon to reside on. Unfortunately, using Docker often entails running and managing your own servers. This means that you are responsible for uptime and maintenance. But, as I will show, you can run a multi-availability zone or multi-datacenter infrastructure with Docker, meaning that downtime for a single machine may not be as critical as you might think. Even if you have a set of Docker containers built and a server running the Docker daemon, you still need to easily be able to launch the containers and redeploy them when a new container image is built. The orchestration service I’ve recently been using is called Tutum. Right now, Tutum is a service that helps you manage your container deployment workflow. At the moment, you can add nodes dynamically from any cloud hosting provider, create new services, and deploy them from a private registry. Additionally, Tutum creates a private network overlay for your containers, meaning that your Docker services have their own private IP addresses that magically route traffic between every other container in your Tutum account, whether the physical machines are in the same datacenter or across the world on a different provider. This allows you to create a multi-server, multi-cloud solution that is extremely resilient to failure. If you’ve ever seen Flannel by CoreOS before, the Tutum private network is similar. I’ve been looking for this type of service for a while now. A while ago, I experimented with the tinc VPN to create a P2P mesh network between multiple Docker containers. This was long before Docker offered the level of network configuration that they do now, so it’s refreshing to see Tutum do the overlay networking so that it just works. Tutum also aims to eventually integrate native CI/CD features, as well as git-push support. When Tutum is finished with these features, it could potentially become the only other service you need besides a source code repository. You may be able to find another service that offers similar features (CoreOS + Fleet or Docker Swarm are potential candidates), but Tutum is a complete solution that’s ready today. Simply run this code on a node to add it to your Tutum account, and the process for each additional node you wish to add (each time, clicking the “Bring your own node” button to get a new token). Once the agent has been installed on all of your nodes, you should see them in the dashboard. At this point, you might want to tag your nodes appropriately. This allows you to specify which nodes your services will run on. For example, you might have a set of nodes tagged as staging or production to specify an environment, or a node tagged as ci which only hosts your CI runners. You can tag a node by clicking it’s name and adding the tags in the left hand sidebar. Now, you can deploy a GitLab CI runner with Tutum. However, we’re going to need a special type of CI runner– we need to be able to run Docker within this container so that we can build our own Docker images. You may be thinking, how is this possible? Since we will be running the GitLab CI runner with Tutum, it will be within a Docker container itself. So, how do you run Docker inside of a Docker container? As you can see, Tutum launches the GitLab CI runner within a Docker container on our node. Additionally, the GitLab CI runner will actually use Docker to build images and run tests, meaning we have two nested levels. I’ve built in DinD functionality into a forked version of the GitLab CI Runner, available on GitHub and the official Docker Registry. Before you setup your GitLab CI runner, ensure that you already have a repository in a GitLab instance as well as a running GitLab CI coordinator. As mentioned previously, you can either host your own instances, or you can use GitLab’s free hosted repository and CI service. Once you have a repository in GitLab, you can link your GitLab CI account with a couple clicks. After you’ve linked your accounts together, you’ll see a list of your repositories in the GitLab CI dashboard with “Add project to CI” buttons next to them. Simply click the button next to your project to add it to GitLab CI, and you’ll see your new project CI dashboard. If you poke around the GitLab CI interface, you’ll notice a menu item titled “Runners”. On this page is a registration token, as well instructions to start a new runner. In our case, we’ll be using Tutum to deploy our runner with the DinD GitLab CI Runner image. Make sure you copy both the registration token, as well as the GitLab CI URL– you’ll need them both in a couple minutes. In your Tutum interface, create a new service. A service in Tutum is a logical group of Docker containers all running the same software and using the same configuration. Each service can have zero or more containers running at one time, and Tutum will orchestrate scaling and scheduling your containers across all of your nodes. On the first screen of the launch wizard, you’ll see a few tabs that let you select where your Docker image comes from. Tutum has a built-in, complementary private registry, as well as support for “featured” images and searching through other public registries, including the Docker Hub. Switch to the “Public Images” tab and search for the “wizardapps/dind-gitlab-ci-runner” image, which is the aforementioned DinD modification I have performed on the official GitLab CI Runner repository. 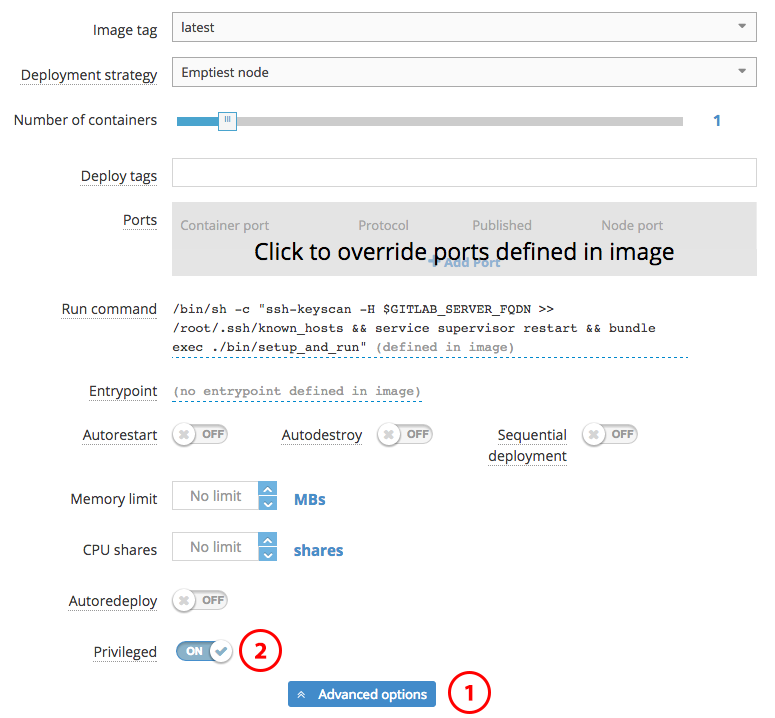 Once you’ve selected the correct image, you’ll be faced with a couple new options regarding scheduling your service containers and basic configuration. For the deployment strategies, it is best to read Tutum’s documentation on their behavior, though the default “Emptiest Node” will likely work for the purposes of the CI runner. You also will likely want to leave the number of containers at 1 unless you wish to do parallel builds. If you previously set tags on your Tutum nodes, ensure you enter the correct tags into the “Deploy Tags” field. Essentially, Tutum will try and find a node that satisfies all of the requested “Deploy Tags”– they are ANDed together. There is one important setting you must change on this first configuration screen, and it’s buried in the “Advanced Options” section– “Privileged Mode”. Docker-in-Docker requires this setting to be enabled, and Tutum fortunately makes it easy to do so. After configuring privileged mode, you can continue to the next screen– environmental variable configuration. Like with the Docker CLI, Tutum allows you to specify environmental variables to be inserted into your Docker containers. However, with Tutum, every deployed container will have the same environmental variables. Though we will not use the links feature for the GitLab CI runner, using Tutum’s dynamic links, containers will have access to other containers’ environmental variables as well. After you’ve configured these variables, it’s time to “Create and Deploy” your service. 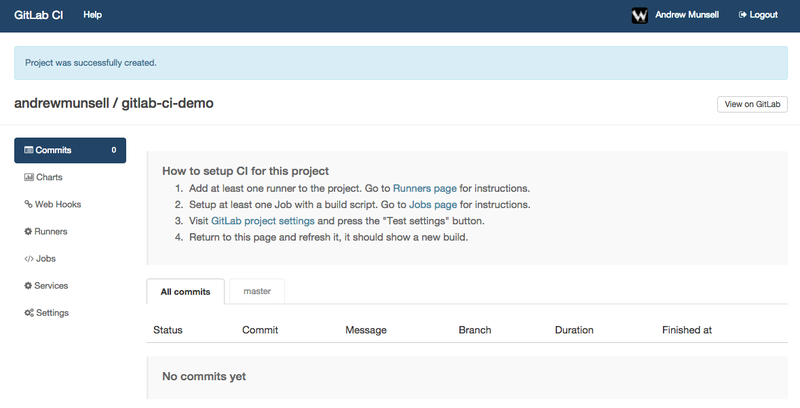 Once the container finishes launching, you can go back to GitLab CI’s “Runners” page and you should see a new entry. You’re now ready to setup the GitLab CI job. The final step to setup our CI/CD workflow is to add the actual job script to GitLab CI. Now, this will vary depending on your project, but one aspect will remain consistent: you’ll end up using Docker to build a Docker container, which is then uploaded to your image repository. In this case, it would be Tutum’s private Docker image repository. GitLab CI jobs can be modified in the “Jobs” tab. Within this section, there are two different subsections– “Test”, and “Deploy”. As their names might suggest, the test scripts are generally used to run unit or integration tests. The deploy scripts are only run for specific branches once the tests have completed successfully. This allows you to have a test script that runs for every commit, and a deploy script that runs only for the master branch and once all of the tests have completed successfully. docker build -t wizardapps/app . At this point, your system should be up and running for builds, and new code should be built as a container and uploaded to the Tutum registry. All that’s left is to create your service on Tutum, and ensure auto-redeploy is enabled. This is done similarly to how we setup our CI services, though instead of making the service “privileged”, we want to enable the “Auto Redeploy” switch. Configure all of your service’s ports, environmental variables, links, and volumes, and then just hit deploy. Congratulations, you now have your own Docker application that is automatically redeployed onto a fleet of servers, but only after the code has been tested! The setup we have requires one CI “service” on Tutum per project– this can quickly get out of hand. As an alternative, you can experiment with the GitLab CI Multi-Runner, which takes a configuration file and allows for multiple projects to be built. Get the latest tutorials, articles, tips, and more about Docker and containerization for free.